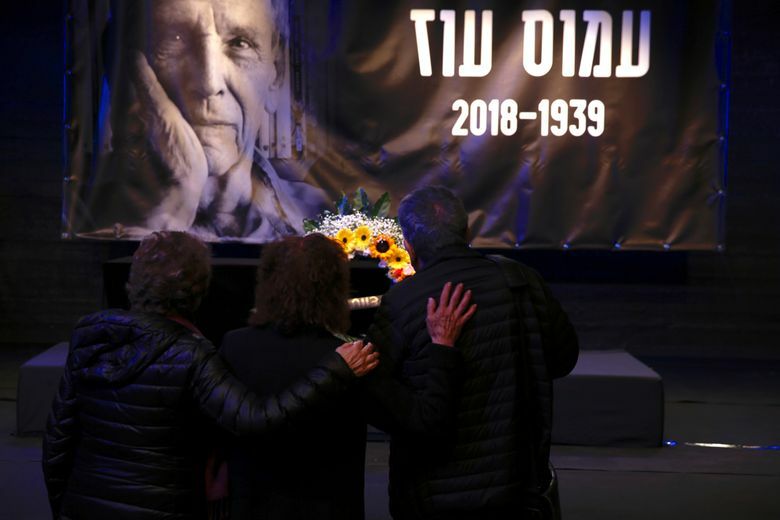 TEL AVIV, Israel (AP) — Israel’s embattled peace movement bid a final farewell Monday to one of its most prominent figures, the renowned author Amos Oz, at a memorial service that tried to restore hope in a political climate that is rapidly shifting rightward. Oz was revered by Israel’s dovish left as an eloquent and outspoken advocate of peace with the Palestinians and a just society within Israel. In a career spanning over half a century, Oz published over 35 books, including 13 novels, as well as children’s books and collections of short stories, and hundreds of articles on literary and political topics. 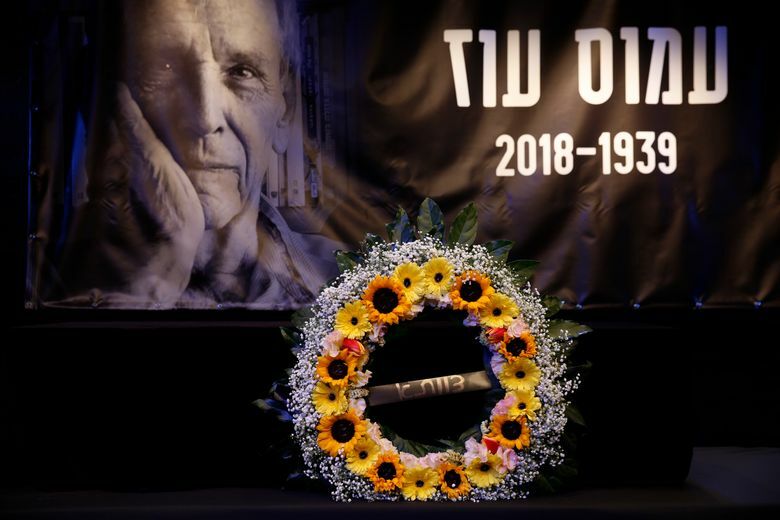 His works about life in Israel were translated into more than 40 languages, more than any other Israeli author, and he came to represent Israel’s peace camp both domestically and internationally. He received dozens of honorary doctorates, won some of the literary world’s most prestigious honors, and was a perennial candidate for the Nobel Prize in literature. At Monday’s memorial, he was remembered as a trailblazing intellectual who envisioned peace with the Palestinians long before it came into fashion — and long after many gave up on it. He was among the founders of Peace Now, an organization that opposes Israeli settlements in the West Bank, and was a leading voice in the 2003 “Geneva Initiative,” an unofficial peace plan reached by leading Israelis and Palestinians. 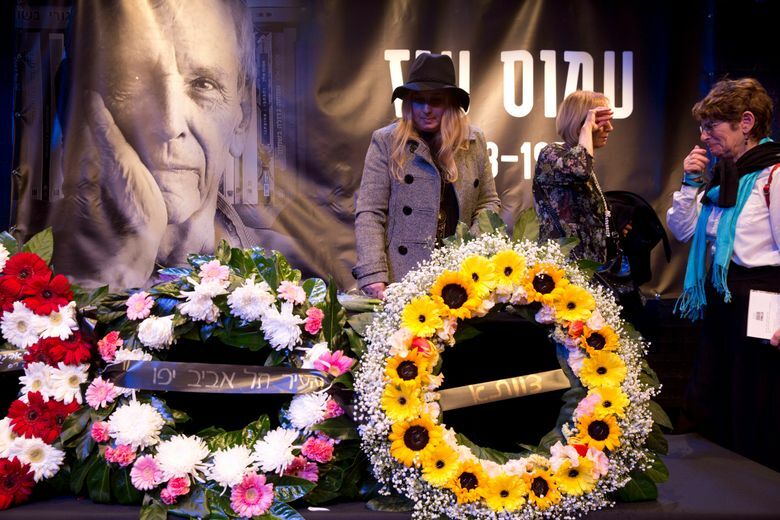 He also was a supporter and activist in Meretz, a dovish Israeli political party, whose past and present party members turned out Monday. Israel’s peace movement has long counted prominent artists, including the authors David Grossman and A.B. Yehoshua, among its ranks. But politically, it has grown increasingly marginalized over the past two decades, and has little public support ahead of early elections set for April. Opinion polls predict a victory for Prime Minister Benjamin Netanyahu’s hard-line Likud Party. Palestinian President Mahmoud Abbas, now largely vilified by Israel’s current nationalist leadership, sent a message expressing condolences that was greeted with applause by the Tel Aviv audience. “He was a true intellectual who offered a clear, lucid voice for peace and equality,” said Ayman Odeh, leader of the Arab bloc in parliament. Oz’s works included “In the Land of Israel,” a work that chronicled his travels and interviews with people throughout Israel and the West Bank in the 1980s, and “My Michael,” a novel about a troubled marriage in 1950s Jerusalem. Oz was born in Jerusalem in 1939, the son of immigrants from eastern Europe. As a teen he rebelled against his parents’ glamorization of Europe and the West and instead was drawn to the young pioneers who built the early state. His well-received 2002 memoir, “A Tale of Love and Darkness,” recounted his childhood in Jerusalem and the suicide of his mother when he was 12 years old. It won him the Goethe Prize and other recognitions, and was adapted into a film starring Natalie Portman. He completed high school at Kibbutz Hulda, a communal farm in central Israel, and return to the kibbutz after completing his mandatory military service in 1961. While working in the farming community’s cotton fields, he published his first short stories. As a reserve soldier in a tank unit, Oz fought in the 1967 and 1973 Mideast wars. After earning a degree in literature from Jerusalem’s Hebrew University, he would spend 25 years on the kibbutz, dividing his time between writing, farming and teaching at the community’s high school. He was buried there Monday in a simple service that included no eulogies. Oz was a close friend of the late Shimon Peres, a former prime minister and veteran politician who won the Nobel Peace Prize for his efforts to reach a deal with the Palestinians. Oz frequently wrote essays and delivered lectures urging the country’s leaders to establish a Palestinian state as part of a peace agreement, earning him the disdain Peres and others also received from Israel’s now-dominant nationalist camp.